I'm not much of a fan of fishing videos - I'd rather be doing it than watching it! but I admit to thoroughly enjoying this one. 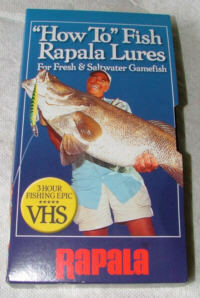 It is a video instruction manual, showing how to get the best from the extensive Rapala range. There is 3 hours of solid entertainment and instruction. Many species are covered, in fresh and salt water, from many worldwide locations. I was surprised at the amount of things I saw that made me think of different ways to present lures, I bet there are very few lure anglers who would find nothing new on this video, it is a typical high-quality Rapala product. But just for a moment, forget Rapala, for a beginner this would show how many different lure types from any manufacturer can be used and I strongly recommend it for that purpose.